HOAL: Science Questions – What are the Space-Time Patterns of Erosion and Sediment Transport Processes? Science Questions – What are the Space-Time Patterns of Erosion and Sediment Transport Processes? Knowledge about the sources of sediments is very relevant for managing contaminants such as phosphorus and for controlling soil loss from agricultural landscapes. During infiltration excess overland flow events in the HOAL, sheet, rill and gully erosion may occur on the fields that are poorly covered by crops, but sedimentation immediately occurs when the sediment laden water enters a field with better cover. Turbidity is monitored at various locations in the HOAL along with autosamplers to be able to calibrate the sediment-turbidity relationships for each event separately. 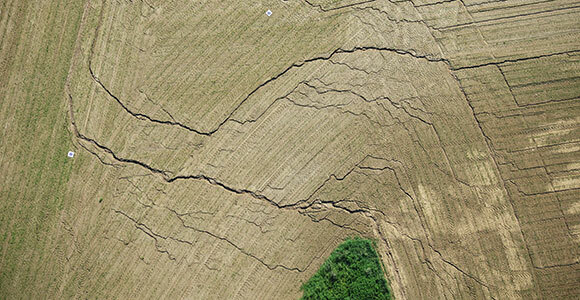 Aerial photographs are taken to identify erosion patterns and calculate eroded soil volumes after erosive rainfall events. To understand sediment deposition and resuspension in the stream, repeated resuspension experiments were conducted, where sediment-free water was pumped into the source of the stream and flow rates, sediment and solute concentrations as well as grain size distributions were measured. The experiments are complemented by numerical modelling.